He becomes the first Asia-born man to make it that far at a Grand Slam tournament. Just call Kei Nishikori the marathon man. Barely 36 hours after winning a fourth-round match that ran deep into the night, the Japanese tennis star made it to his first Grand Slam semifinals when he outlasted third-seeded Stan Wawrinka, 3-6, 7-5, 7-6, 6-7, 6-4 Wednesday at the U.S. Open. He becomes the first Asian-born man in the Open era to get that far at a major championship. Nishikori had just completed an epic five-set victory over Canadian wunderkind Milos Raonic that began Monday night and lasted until 2:26 a.m. Tuesday morning. Fighting exhaustion, he managed to dig deep in the fifth set to turn back the Australian Open champ and set up a semifinal match Saturday against the winner of Wednesday’s late match between top-seeded Novak Djokovic and 2012 Open winner Andy Murray. Thus Nishikori continues his rise through the rankings despite the presence of a galaxy of luminaries. 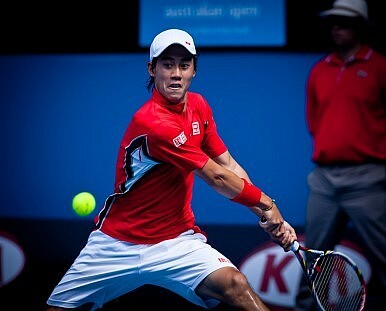 In his breakout season of 2014 he became the first Asian-born man to crack the top 10 in the ATP world rankings. He’s won two titles this year, nearly won a third before retiring against Rafael Nadal in the Madrid Open final, and reached the fourth round of both the Australian Open and Wimbledon. In his two five-set upset victories, Nishikori’s fight was in many ways reminiscent of his coach, who made a career out of beating bigger and stronger opponents. While Nishikori outfoxed his more powerful foes, Michael Chang was anxiously sitting courtside hanging onto every rally. Chang became Nishikori’s coach early this year and has significantly helped him in developing an all-around game and better stamina. Chang, who rose to as high as No. 2 during his playing career, remains the only player of Asian descent to claim a major title with his win at the 1989 French Open. At 5-foot-10, Nishikori isn’t as big and doesn’t possess as big a serve as most of tennis’ top players. But like the 5-foot-9 Chang, he’s quick afoot with abundant athleticism. He can get to balls out of reach for most players and has a lethal two-handed backhand that comes with deceiving pace. It remains to be seen whether in the near future Nishikori can crack the stranglehold on the Grand Slam by the “Big Four.” Since the 2004 Wimbledon, all but three of the 41 major titles have been won by Roger Federer (15), Rafael Nadal (14), Djokovic (seven) and Murray (two). But with Federer nearing the end of his career, Nadal oft-injured and Murray sliding after his historic Wimbledon win last year, a window might be open for Nishikori, who at 24 will battle next-generation stars such as Raonic (23), Grigor Dimitrov (23) and Ernests Gulbis (26) to break through. China’s Peng Shuai made her own breakthrough at this Open, moving into the semifinals for the first time in her career in Grand Slam singles play. Peng cruised through her five matches without dropping a set – including an upset over fourth-seeded Agnieszka Radwanska – to arrive at her contest Friday with No. 10 Caroline Wozniacki. Overshadowed by her better-known compatriot Li Na, who is sitting out this year’s Open because of a knee injury, Peng is nevertheless an accomplished doubles player. She’s won two Grand Slam titles partnering with Taiwan’s Hsieh Su-wei, including this year’s French Open. To win her first major singles title, Peng still has a daunting task ahead. Wozniacki, a former World No. 1, is having a bounce-back season not so coincidentally after her breakup with fiancé and world’s top-ranked golfer Rory McIlroy in May. Should Peng upset Wozniacki, she’ll face either No. 1 Serena Williams or Ekaterina Makarova, another doubles specialist who’s having a breakout performance at Flushing Meadows. Peng’s triumphant run has brought much joy for the Chinese, despite her well-known battles to free herself from state-controlled scheduling and confiscation of prize money. Now with the ability to danfei (fly solo), Peng has soared to new heights. For both men and women, 2014 has been a breakout year for Asian tennis players.